Just short of four months ago, we announced the availability of pull request testing on Travis CI. Just recently we announced the availability of pull requests for everyone and all of their projects by default. Since then, travisbot has been busy, very busy, leaving comments on your pull requests, helping you make a fair judgement of whether a pull request is good to merge or not. We have built more than 17000 pull requests since we launched this feature. We salute you, travisbot, for never letting us down! 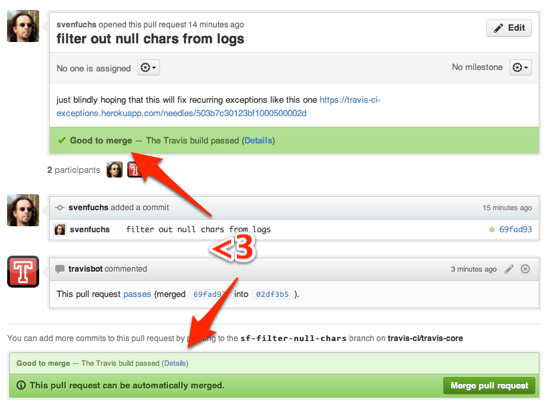 Today, and largely thanks to the fine folks over at GitHub, pull requests are getting even more awesome. Check out the full story on the GitHub blog. Instead of relying on travisbot to comment on pull requests to notify you of the build status, pull requests now have first class build status support. What does that mean? A picture says more than thousand words. Here’s how every pull request looks like when it’s successfully built on Travis CI. All green, good to merge! It is just as awesome as it looks. But you should try for yourself immediately! When a new pull request comes in, we start testing it right away, marking the build as pending. You don’t even have to reload the pull request page, you’ll see the changes happen as if done by the magic robot hands of travisbot himself! Should a pull request fail the build, as unlikely as it may seem, you’ll see a warning about merging this pull request. This is true for a pending build as well. They’re both marked as unstable. You can merge it, but you do so at your own risk. After all, isn’t it nicer to just wait patiently for that beautiful green to come up? We thought so! In all three scenarios, there’s a handy link included for you, allowing you to go to the build’s page on Travis to follow the test log in awe while you wait for the build to finish. Just click on “Details” and you’re golden! There is a neat feature attached to this. 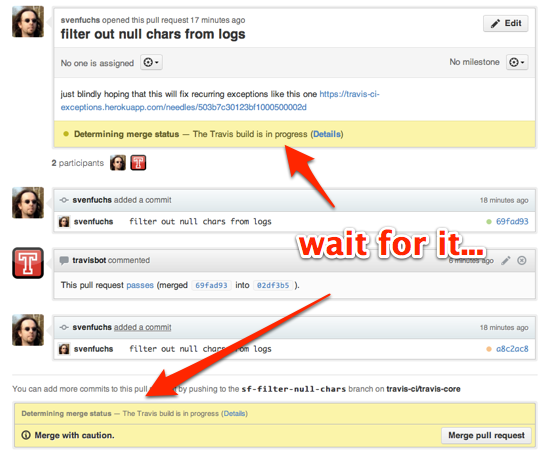 The build status is sneakily not attached to the pull request itself, but to the commits included in it. As a pull request gets more updates over time, we keep updating the corresponding commits, building up a history of failed and successful commits over time. This is particularly handy for teams who iterate around pull requests before they ship features. 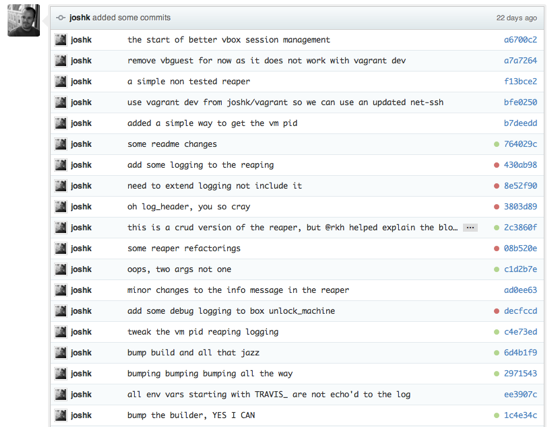 Let’s have a look at what Josh has been up to in this pull request. Notice the little bubbles next to each commit reference. Want to have a look at what it looks like for real? No worries, here’s a pull request on the rspec project, here’s one from Mongoid, and here’s one from the Zend Framework project. The great news is that this awesome feature has been active on Travis CI for a while now, meaning hundreds of existing pull requests will immediately have a build status attached and displayed in the user interface. This is true for open source projects on Travis CI and for private projects on Travis Pro. Due to an unfortunate issue that we failed to notice early on, pull requests opened around Thursday and Friday of last week unfortunately weren’t properly updated on Travis CI at the time. If they got any new commits or updates to the pull request in the mean time, that should be fixed by now. We apologize for the slightly reduced show effect of this new hotness. 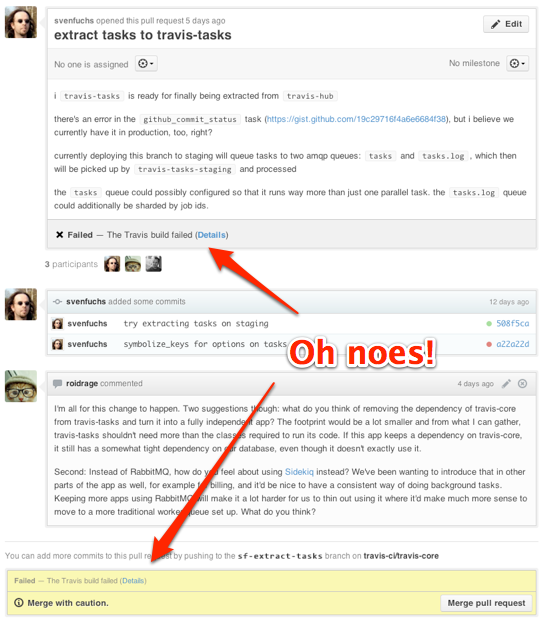 Now, the bad news is that this means that travisbot is going to retire from commenting on your pull requests soon. You all learned to love him just as much as we do, and he might just have a comeback at some point in the future. Until then, he’ll be hanging out in our Campfire room, enjoying a little less chatter around him. Note that this build status awesomeness only works if we have a user with administrative rights set up for the repository in question. We can’t update it if we don’t have admin rights unfortunately. If you have set up a repository where you’re not a user with admin rights, you need to find someone who does and have them log in to Travis, we’ll sync the permissions automatically and use their credentials.